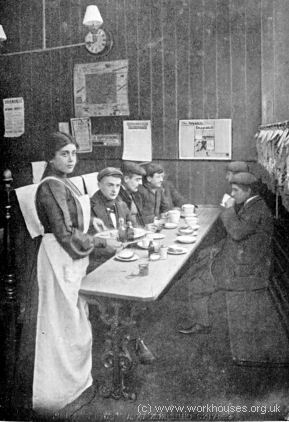 Olive Malvery serving in a coffee-shop. Olive Malvery was born in around 1876 and after their parents separated, she and her brother were given an Anglican upbringing by their grandparents. She became involved in philanthropic work in the Punjab, raising money for Dr Barnardo's children's homes. She came to London in 1900 and trained as a singer at the Royal College of Music. She joined the ranks of social explorers in the early 1900s and mingled undercover with tramps, thieves, factory girls, and domestic servants, to observe the lives of the poor and destitute. Her foreign appearance probably helped her to blend in with such communities. In 1904 Pearson's Magazine published a series of her articles which were much enlivened by her phonetic rendering of the speech of those she mingled with. The articles were subsequently republished in 1906 as The Soul Market, followed by Baby Toilers (1907) which exposed the use of child labour. Her writings established her as a social commentator and reformer particularly in the provision of night shelters for destitute women. She donated profits from The Soul Market towards the establishment of two shelters for homeless women in London, and supported many other such ventures. She contracted cancer and died from an overdose of sedatives in 1914. ...a few nights later, I found myself on the wet steps of the Embankment in company with a wretched creature who, for ten shillings a week, could have been made happy and comfortable for the remainder of her poor old life. I stumbled over the miserable bundle of rags somewhere on the steps by Westminster Bridge. "What is the matter?" I said. "I'm knocked, that's wot's the matter; ill, 'ungry, and knocked." The words came in despairing groans. The poor old woman was indeed a woeful spectacle, huddled up on the slimy stones, as she turned her poor, sorrow-lined face to mine. The light of the flickering gas-lamp overhead revealed the fact that she was very feeble and very old. The few thin, straggling locks of hair escaping from the rain-soaked bonnet were white. She was wet and cold, and shiveringly drew her ragged shawl more tightly round her weary old body. "Why are you sitting here? Have you no friends, no home?" I asked. "'Ome! I ain't got no 'ome," she said. "Then why do you not go into the workhouse?" I questioned. "I'm afraid I'll 'ave to. I've kep' out as long as I can," she groaned; "but, my Gawd, I'll 'ave to." There was no mistaking the evident horror this miserable, almost dying old woman had for the workhouse. It surprised me. " Why?" I asked myself. " Surely no place nor condition this side of the grave could be worse than she now finds herself in?" Ratepayers, Boards of Guardians, and the Local Government Board provide and organise homes and refuges for helpless and poverty-stricken creatures, such as the poor woman who lay moaning and shivering here at my feet, yet she, like many others of her class, dreaded to accept this charity. This was not the first time I had observed a terror of entering the workhouse exhibited by a starving and destitute person. "Can there be a reason for this dread of 'the big 'ouse,'" I thought, "or is it mere prejudice only?" Standing on those draughty, rain-washed steps, I determined to probe this question to the root, and find out by personal experience the conditions prevailing in some, at least, of these refuges provided for the homeless and forlorn. Stooping down I asked the poor old creature to let me assist her up the steps, and invited her to come with me to a coffee - stall which I knew always stood at this time in the morning opposite Somerset House. I had scarcely raised the tottering woman from the stones when I heard the measured tramp of feet descending the steps, and a moment later, the light from a policeman's lamp was turned upon my companion and myself. "Now then, my gals, up and out of this. Look slippy, the Sergeant will be round in a minute," the constable said, in a manner that I thought not unkindly. "This poor woman is ill, Officer," I said. "Why don't she go into the 'orspital or the hinfirmary, then?" and stooping down, he took her arm and said: " Was up, mother?" "Ill, sir, and broke," she said.
" You looks it," he muttered. "Will you help me to get her up to the top of the steps?" I said. "If you can do this, I will give her a cup of hot coffee." " All right, miss — come along, old lady," he said good-naturedly, and helped by his strong arm we soon had the suffering creature into the roadway. "Go and 'ave a cup of coffee with this girl, mother, and take my advice, go into the workhouse as soon as you can get in this morning." At the coffee-stall I procured for her hot coffee, bread and butter, and an egg, which she devoured like a famished animal. After her meal she felt better, then I began to question her with reference to her hatred of the workhouse. "My dear," she said, "the spike' is worse than the prison." "What do you mean by the 'spike'?" I asked. "Why; the casual ward," she said, surprised at my question. "Surely it is better to be there than out all night in such weather as this. Why do you fear it so much?" I asked. "Oh, I don't know that it ain't; but I hate it, they bully you so. It's just awful." "Well, I intend going in myself to-day," I said. "Yes," I replied. " Why not?" "But you've got some money," she said, "and if you go in with any money on yer they can lock you up." "I haven't much money," I said, "not more than we must spend on a good breakfast. After that you and I will go straight to the nearest casual ward and ask them to take us in." "All right, me dear, so we will. I can't do another night on the stones, it will kill me; but we mustn't go to the nearest place," she said. "I was there a couple of weeks ago, and if they caught me there again in less than a month, they'd put me in a cell, give me oakum to pick, and keep me in for five nights." "Are you not allowed to go into a casual ward more than once in a month? "I asked, astonished at this information. "That's all — that is, in London casual wards. And you are supposed to go fourteen miles before you go into another spike," she continued. "Do you mean to say that a weak old woman like you is obliged to walk that distance between casual ward and casual ward?" "Yes, my gal, or if you don't you're a-breakin' the lor; so what we'll do," she continued, "we'll go across the water to the L—, then we'll tell them that we've come from 'Arrow, and that we're a-goin' to Croydon, then we'll be all right." To this ingenious proposition I agreed. "We shall 'ave to sit about in the park for an hour or two," she said, "'cause we can't get in afore one o'clock." So we went and sat on a bench in one of the parks. At twelve o'clock we started off to the dreaded "spike." We arrived at our destination just before one o'clock. When we reached this place there were ten other poorly-clad women standing in a row in front of the red brick building, which I guessed was to be our place of refuge from the street. We silently joined the ragged file, and soon after a neighbouring clock struck one. Almost on the stroke of the hour, a young man, clad in a neat uniform, came from a building on the opposite side of the street, and crossing over to where we stood, he unlocked an iron gate which shut off a covered courtyard from the street. "Look alive!" he said, in a surly manner, and the women filed past him into the yard. When we had all entered, he relocked the gate and went back to his office. "Sit down, my dear," said my old companion; "it's as cheap as standin'." "But shall we have to wait long?" I asked. "Till four o'clock," was the dreary response. "Won't they give us anything to do, or let us into shelter until then?" I asked. "No. At four o'clock they admits us; till then we waits 'ere." This was a fact. For three hours fourteen starving, shivering women, one with a young baby, had to crouch on the stones in a draughty yard, with not even a seat provided. There we waited, a pitiful company, exposed to the curious view of every passer-by. The iron gate which shut us off from the public thoroughfare was no screen to hide our misery from the curious, contemptuous, or indifferent passers-by. The lagging minutes dragged on till it was four o'clock, and the young man in uniform again appeared. He marshalled us into an office. Seated at a desk was another male official, in front of him a large book, and at his side a young, strong-looking woman, wearing a uniform something like that worn by a hospital nurse. As each woman passed in front of the desk, a number of questions were asked: "Name?" "Occupation?" "Age?" "Where born?" "Where from?" "Where to?" Each question, swiftly and abruptly flung at the woman before the desk, was answered with more or less truth by each applicant. The answers were entered in the book, often without even a look at the speaker. After my replies had been entered, I was told by the young woman to pass on into a long, bare room. This room was also unprovided with seats, and in there the "casuals" had to stand until all had been questioned in the office. By this time it was nearly five o'clock. We were at last all gathered in the room; then the young woman official entered, and ordered us to pass her one by one to be searched. She did not touch me, but asked me what I had in my pocket. I said truthfully: "Nothing." She then bade me pass through into another room. In this room was a sort of window, with a sliding panel, similar to a window at a railway ticket-office. Through this was passed out to each of us a tin mug and a piece of bread. The mug was filled with a thick, white mixture, which I learned to know as "skilly" — a sort of coarse, half-liquid oatmeal porridge, without seasoning. On the edge of the window was a wooden salt — cellar. I was told we could help ourselves to salt, and we all did so to mitigate the horrid taste of the gluey stuff in the mugs. In the room were two long, bare tables, and on either side of them were placed rough benches without backs. Here, at last, we were able to sit down. By this time I was genuinely hungry, and tried to eat the bread and porridge, but found it difficult. The bread I ate; but not then, or ever, could I manage to swallow the skilly. Why this mess is given, I cannot understand. Why not a good basin of cocoa or even tea? It would hardly cost more, and would certainly be more humane. But the only food I had in this place, or in any casual ward I entered, was the same as this meal, excepting that at dinner a piece of cheese was given with the bread. "Baths! I'm sick of baths; wherever yer go, yer Bits baths. Sickenin' I call 'em." This, I am afraid, is quite a real grievance to the lowest and more degraded casuals. In some places, unfortunately, such cleanliness does not prevail in the casual ward baths, as I discovered later. After the bath, each woman was given a night-dress. It was clean, and did not appear to have been worn since it had been laundried. Attired in this, I was sent across a stone passage into a long dormitory. Ranged on either side of this room were ten beds. Though not soft, they were clean. Sheets, blankets, and good pillows were provided. I think that the beds were equal to those one would find in dormitories of orphanages or convent schools both here and abroad. I have visited many such and found similar cots. I went to bed, and after listening to the grumbling remarks of the old women on either side of me for some time, went to sleep. The hospitality, though cold and heartless, was infinitely preferable to the exposure of the cruel streets, but afterwards, during other visits of investigation, I encountered such brutality in these places that I sympathised with the wretched outcasts who shrank from entering them. At six o'clock next morning, I was wakened by the young woman who had ordered us to our supper and bath shaking me. I had to cross to the bath-room, get my clothes, and dress. When I had dressed, I was told to go to the dining-room. I did so, and found on the table several tin mugs of skilly and several pieces of bread. This was breakfast. A short grace was said and we commenced to eat. Breakfast finished, we were detailed to different duties. I was sent into the laundry. This was a large, well appointed place, fitted with machinery. The laundry was under the supervision of a healthy, pleasant-looking woman, who seemed to know by name several of the women who had been sent with me to work under her. "Can you iron?" she asked me. "I can try," I answered. "Very well, then; go over to that ironing-table and iron those night-shirts," she said, not ungraciously, having marked my willingness to work. I did the best I could. I noticed that several of the women appeared to be quite expert laundresses. I worked on until noon. There seemed to be no restriction as to talking, and we were all talking when the matron and the dreaded "inspector" entered. This man looked at every "casual" closely, then passed out of the place without saying a word. Soon after he had left the room, however, an official entered, and ordered an old woman who was ironing on the same table as myself to come to the matron's office. One of the other women told me that the inspector had "spotted" her as a woman who had infringed the rules by being in another metropolitan casual ward within the prohibited time. "She'll get 'cells' and oakum," she informed me. I suppose this happened, because the old woman did not return. At noon we were told to leave off work and go to dinner. This meal was also served in the room in which we had breakfast, and consisted of bread and cheese. After a rest of an hour, we returned to our duties, and worked on until five o'clock. At that hour was finished our work for the day. "Tea" was given to us, or rather skilly and bread. How I longed for a cup of tea! After this meal we were sent to bed. The night passed in the same manner as the previous one. At six o'clock next morning, I was awakened in the same way as the morning before, but my clothes were now by my bedside. I dressed, and was told to do some cleaning and dusting. After I had done this, I was given my breakfast — more skilly and dry bread. At eight o'clock I was allowed to leave the establishment. I inquired for my companion, and was told that she had been admitted to the infirmary. We do not wish to encourage pauperism, and certainly the casual wards cannot be accused of over-tenderness to the poor. There is no sympathy, no touch of humanity — all is coldly and severely ordained. The outcasts come and go, "nobody's people." Later, I tasted the bitterness of the cup of charity provided in others of these wards — brutality and insult being the portion of the applicants for refuge. But here it was not cruel. It deprives one of liberty for nearly forty-eight hours and sometimes longer. The food is not palatable, and the work demanded is quite out of proportion to the value given by way of food and shelter. The keynote of the establishment in which I sojourned was exemplary cleanliness. The tone adopted by the officials was a horrid surliness, and I was glad I was not an "habitual."